eBay enterprise vice president and CMO, Mark Kirschner, chats to Harvey Norman CDO Gary Wheelhouse during MagentoLive in Sydney. “I don’t think anyone would suggest that Harvey Norman was an early adopter of online. 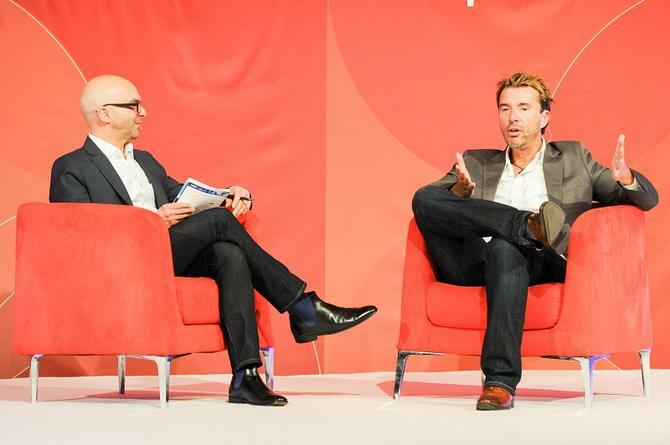 In fact, I would say there is a last mover advantage strategy,” he told delegates at MagentoLive in Sydney. When Harvey Norman started its online journey in 2011, it wanted to bring the retail options to online, such as the ability for customers to interact with salespeople using live chat. “One of the primary reasons customers go into stores is to talk to people. We very quickly understood that live chat was something we needed to do. If you are online and chatting to someone from Harvey Norman, you are talking to someone who has worked in a store and sold those products,” said Wheelhouse. To improve the online experience, Wheelhouse has focused on what he calls customer journey mapping. This involves using a wealth of information from customer service and social media. For example, there might be a case where a Harvey Norman customer has gone for the click and collect option. This is where they buy an item from the website and then collect it from the store. “You might read about a customer who has done a click and collect and has had to go to the store three times. That’s just terrible, you’re telling me another way to go and shop,” he commented. According to Wheelhouse, click and collect is the perfect meeting of the online and retail experience. Hand in hand with online comes mobile commerce. Wheelhouse said it has put a lot of time into making the mobile website responsive so that customers can shop on their smartphone or tablet. “It’s great to look at the stats on a Saturday night and see that 60 per cent of your traffic is coming from mobile. I’m expecting that Boxing Day [sales] will be bigger for mobile than desktop,” he said. To solve this problem, Harvey Norman is looking to arm sales staff with more information on a device so that they can assist the customer with an in-store sale. Beacons may also be on the horizon. Wheelhouse told delegates that he has spent a lot of time looking at overseas Beacon examples from Target and Walmart in the United States to see what works in a retail environment. There are no shortage of [Beacon] players in Australia. That is something we would go out and test and get some results. That isn’t something that I think would be a long way away,” he said.